Have I mentioned once or twice that I love audiobooks? 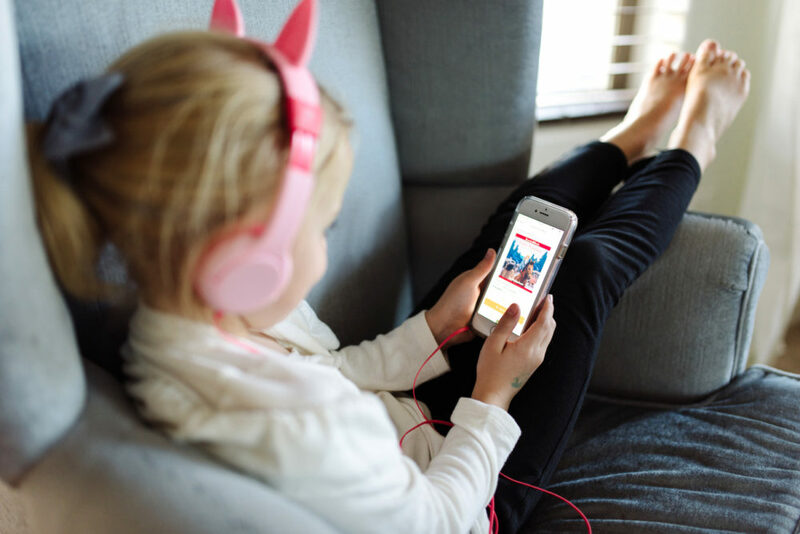 (A whole section of my free course, Raising Readers, is dedicated to audiobooks and it’s the section that I get by far the most response about as parents discover a whole new way to help their children love books and reading). I use all sorts of different methods to get audiobooks, from picking up CDs at the library, to using Overdrive (the digital audiobook system that most libraries use) and Hoopla, and, of course, Audible. I love Audible for lots of reasons, but mainly because their platform is the easiest to use and they have the biggest collection. Also, you own the books, so they never expire, and you can listen to them whenever you want. I don’t necessarily re-listen to a lot of books (too many new ones to get to! ), but my children LOVE listening to their favorites over and over again and over the past year, we’ve built up a decent little Audible library of children’s books that we can listen to in the car or play on the tablets while they’re going to sleep or listen to while we color, do craft projects, cook, or do puzzles. 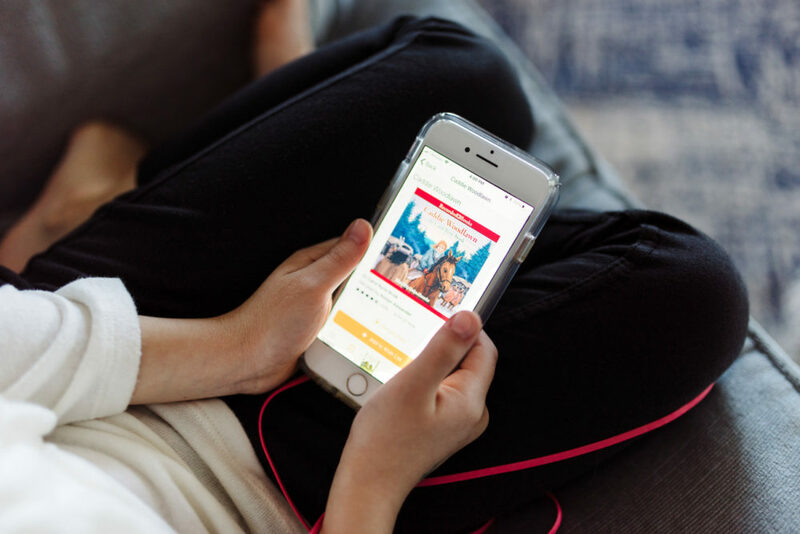 An Audible subscription is great for getting expensive audiobooks at a much cheaper rate, but you don’t have to have an Audible subscription to use their app. The app is free and once you download it, you can buy any audiobook you want and it will get automatically added to the Audible library on your app, so you can listen whenever you want (which would be every single time we get in the car – I have listened to Frog and Toad All Year approximately 73 times in the past week). Until November 27th, Audible is having a massive children’s audiobook sale with hundreds of audiobooks available for $3.95 or less. Obviously, it would be poor economics to use your Audible credits from your subscription for these super-cheap books (save those credits for the $40 audiobooks), so I’m always keeping an eye out on these sales for good titles to add to my digital library and make those daily school trips and the longer road trips much more pleasant for all of us. I so clearly remember reading this book with my sisters when I was probably 10 or 11, and just DYING over the last couple of chapters. I cannot wait to read this one to my girls – there’s just something so intriguing about super brilliant rats (plus, it’s a Newbery winner). In our family, the Beverly Cleary books on audio are definitely in our top 5. We’ve listened to many of them together, and my girls love listening on their own. And I just love Henry Huggins. Fair warning that this might not be safe to listen to while driving unless you are very good at driving while tears pour down your cheeks. Does it get better than Roald Dahl? This might be my very favorite book of his – I just re-read it with Ani and I loved it just as much as I did when I read it to Ella in 2014. Ella listened to this whole series and loved every second of it. My sister has three boys and they are obsessed with it too. There are 13 books in the series currently and all but 3 of them are on sale for $3.95 right now. My mom read this book when she was young and loved it, and I read it when I was in middle school and loved it too, about a girl who is given the gift of magic from her grandmother and now can read thoughts and control people’s actions. How is she going to use it? I read this book in about fifth grade when we did a big homeschool unit about Egypt and it was one of my favorite novels I’d ever read. This was the series that really got Ella into audiobooks when she was about four. We have listened to this in the car, I’d estimate, at least 500 times. Plus, it’s good prep for the movie version coming out at Christmas time. If you have a child who would happily listen to you read this 10000 times in a row, Audible might save your vocal cords (and sanity) by having someone else read it aloud. Kevin Henkes never disappoints with his sweet little stories of mice jammed with personality. This is a childhood classic that I’d somehow never read until my parents gave Ella a copy for her 6th birthday. I LOVED it. (Full review here). This book is young adult at its finest. I can’t say enough good things about this novel about a teenage boy whose younger brother is diagnosed with cancer (Full review here). This book about a young girl and a skeleton detective who team up to solve a mystery is laugh-out-loud hilarious. Fair warning – I’ve only read the first book, and I’ve heard that, like Harry Potter, later books in the series get pretty dark. (Full review here). The whole Hank the Cowdog series is HYSTERICAL. Both my older girls love them, and I’ve loved them since I was a child. For a couple of years, we always got a new one when we went on a road trip as a family. I love me some Andrew Clements and this is the first book of his I ever read. Although I was about 24 when I listened to it and it features fifth graders, I still related SO much to these children – it made me feel completely like a 10 year old again, in the best way. I have a goal (that I’m working on a snail’s pace) to read all the Newbery books and when I had a commute an was feeling really ambitious, I knocked out a dozen or so I’d never read before. This one, which I listened to during many snowy drives through Boston, was just so sweet and I couldn’t believe I hadn’t read it before. I think audiobooks are a wonderful way to introduce your child to poetry because poetry is really meant to be read aloud and a car ride is a perfect time to just sit back and enjoy it. I love a good early reader chapter book (like Frog and Toad) and this is another favorite we discovered when Ella was about three. If there are others in the sale that stand out to you, let me know! I just bought Frog and Toad Together and several Cowgirl Kate and Cocoa books because they are all on sale for $1.95. Oh my goodness, I remember reading The Gift of Magic! Doesn’t it end (spoiler to everyone else), “and they had a daughter named Lois and she had the gift of storytelling”, or something like that. Maybe I’m remembering wrong. But even now I get shivers remembering how amazed I was with the tie-in to the author! My kids are big readers and big fans of audiobooks, so I’m definitely going to check out some of these new recommendations. Thanks! We are listening to that particular audio version of Charlie and the Chocolate Factory right now and it’s really top-notch! The gentleman who reads is fantastic and the little bit of sound effects they’ve added are rich as well. Highly recommend! Hi! I’m new to audio books — do your children read along (the physical book) w the audio book? And I’m one of your pics, is your daughter ‘watching’ the audio book? So many questions! They rarely use a physical book when they listen – I’d say less than 1% of the time. Totally grabbing Charlie and the Chocolate Factory! If you purchase an audiobook as a Christmas gift for your girls, how do you “wrap” or gift it for them? A card in the stocking? thanks for this list, buying now! Thank you! I just ordered a bunch. Hopefully quiet time will be a little smoother now! Thanks so much for the tips!!! 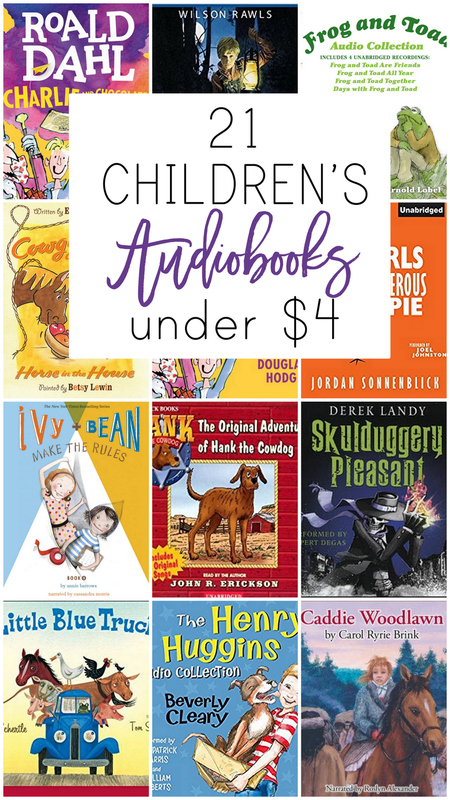 I’m LOVING my kids with audiobooks almost as much as I love them for myself, and that’s saying a lot! 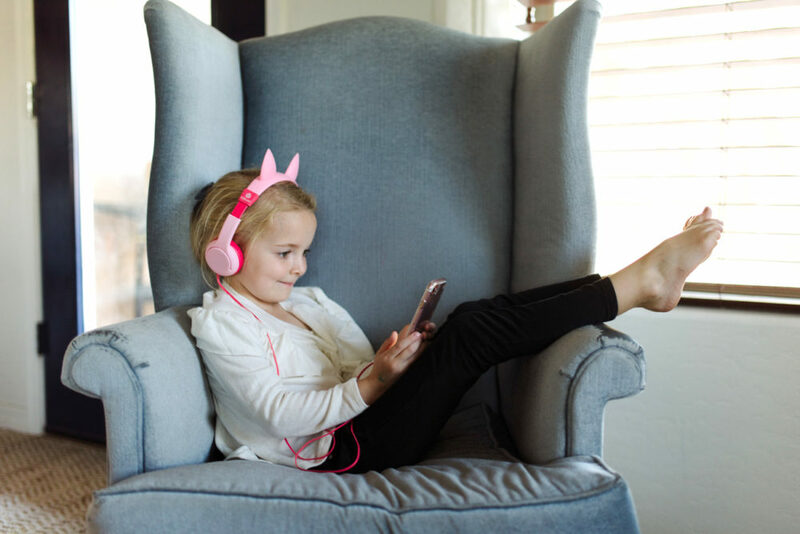 I know you’ve done posts before on the “how” your girls listen to audiobooks, but I noticed your daughter is holding a phone in one of these pictures and listening to a book. How do you do it so your girls only listen to what you want them to listen to and aren’t listening to you entire library and/or deleting things or changing settings? I tried setting up a kid’s profile through Amazon to do it, but you can’t share Audible content with child profiles. Any suggestions? Is there an app or something that I can use to only allow navigation within a certain app or something? How do you do it? Help! 1) This picture is not particularly representative of how they listen – it was just to make it clear that they were audiobooks for children. They almost never actually look at the screen (and they never really use my phone) when they’re listening. They’re almost always coloring, working on puzzles or just laying on the couch or in bed. 2) They mostly listen in Overdrive when they’re listening on their own – we use Audible almost exclusively in the car, so I do all the navigating of the app, and then in Overdrive on their tablets, I just download the books for them. 3) I’m pretty sure even if he deleted something from your Audible library on your phone, you could just re-download it. 4) You can set a lock screen so once you turn it on, they can’t use the phone at all (we used this a lot on our phones and iPad when Star and Ani were younger and would accidentally navigate away from the show and we had to fix it every five minutes).